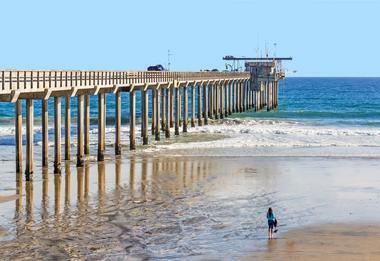 San Diego has pleasant weather throughout the year with a mild climate, good air quality, and low humidity. But there are some times that are better to visit the city than other times. From March through May and from September through November are some of the best times to visit San Diego because there are not as many school breaks during these times. For the best accommodation rates, winter time is an option although you will experience some rain. The climate also depends on where in San Diego you find yourself. There are three distinct areas that have their own climates - these are the coastal area, the desert, and the mountains. January, is one of two of the coldest months of the year. Average high temperatures don’t get any higher than 65°F (18°C), while the average low temperatures drop to 49°F (9°C). In February, while the average high temperatures remain at 65°F (18°C), the average low temperatures creep up ever so slightly to 51°F (10°C). This month has a least amount of sunshine out of the whole year, roughly 212 hours on average, while also being the wettest month out of the year. Average precipitation levels are just over 2 inches (58 mm). San Diego Weather in March: The temperature increases just a tad in March, going up by a single degree for average high temperatures. For low temperatures, the average is 53°F (12°C). April signifies the beginning of Spring in San Diego. Temperatures rise but remain cool with high temperatures averaging 67°F (20°C). Low temperatures average 56°F (13°C). This time of the year is great for enjoying the beauty of nature and seeing flowers start to bloom. In May, temperatures continue to creep up every so slightly. The average high and average low temperatures range between 69°F (20°C) and 59°F (15°C). For those who are keen to do some hiking and mountaineering, this month is ideal as it stays cool and conditions in the mountains are ideal. San Diego Weather in June: Average high and average low temperatures in June continue to increase. High temperatures will peak at an average of 71°F (22°C). Low temperatures are 62°F (17°C). In July, temperatures increase a bit more by a few degrees with average high temperatures of 75°F (24°C). This month also has the most hours of sunshine out of the whole year with an average of 293 hours. July also ties with August for the driest month of year with close to 0 inches (1 mm) of precipitation. August is the hottest month of the year with an average high temperature of 76°F (25°C). Low temperatures are 67°F (19°C). September ties with August as the hottest month of the year. Temperatures stay exactly the same during this summer month. Although it is one of warmest, the climate is still enjoyable. In October, the weather decreases by a few degrees with an average high temperatures of 73°F (23°C). This month starts San Diego’s transition to fall and average low temperatures will go down to 61°F (16°C). San Diego Weather in November: For the month of November, the temperature decreases a few more degrees. Average high and average low temperatures range between 69°F (21°C) and 54°F (12°C). December is one of the two coldest months in the year and marks the beginning of winter for San Diego. Average high temperatures tie with January at 65°F (18°C), but average low temperatures decrease by one degree. 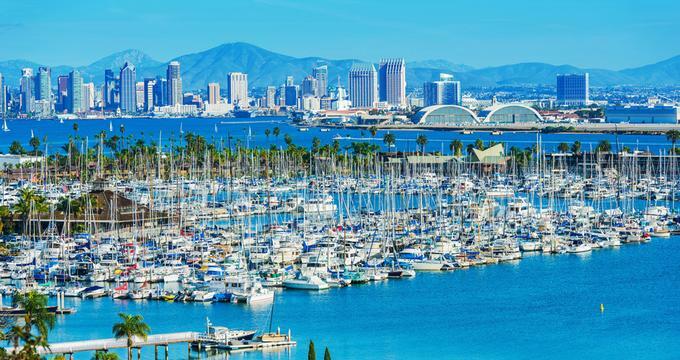 The great thing about San Diego is that the averages for both high and low temperatures generally stay more or less the same all through out the year, so the whole year is a fantastic time to explore everything that California and the city has to offer. When it comes to exploring the mountains and forests, April through May are the most ideal months due to it being the low season. For the popular attractions like Legoland and Disney World, it’s best to go when school is in session and even more ideal to avoid going during public holidays. Explore wine country from April through June, to see first growth of the vineyards. Many people arrive in San Diego by airplane. The San Diego International Airport, also known as Lindbergh Field, is located just three miles northwest of downtown San Diego. It is a very small airport with just one runway, so it is used mostly by national airlines. People who want to arrive by train will need to travel first to Los Angeles and change trains for the trip south to San Diego. 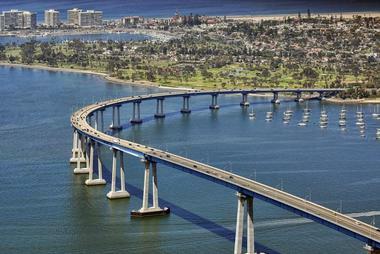 Arriving by car is easy because there are three interstates that lead to San Diego: I-5, I-8, and I-15. Greyhound buses serve San Diego arriving from many cities such as Las Vegas, Los Angeles, Phoenix, and many other cities in the southwest. The San Diego International Airport is a small airport, but there are many ways to get from the airport into the city. There are several car rental companies that are located at the Rental Car Center: there is a free shuttle from the terminal to the car rental center. Several shuttle companies take visitors into the city: these shuttles are located just a short walk from the baggage claim area. San Diego’s Metropolitan Transit System Route 992 bus leaves the airport every 15 minutes and operates 365 days a year. There are several taxi companies located at the airport. Because the airport is so close to downtown, it is possible to bike to and from the city. There are several visitor information centers located at convenient places in San Diego. Some of these include the Balboa Park Visitors Center, the California Welcome Center Oceanside, the Old Town San Diego Chamber of Commerce and Visitor Center, and the San Diego Visitor Information Center located in downtown San Diego. At any of these visitor information centers, the friendly and professional staff members can help visitors find accommodations, plan itineraries, give directions, suggest attractions, restaurants, and shopping areas, and much more. There are maps, guides, and brochures that are available to visitors to help them make their visit to San Diego pleasant. San Diego’s MTS transit system includes its buses and trolleys. The bus system is a good way to get around the city. There are bus stops every other block or so, and drivers tend to be helpful and friendly. Buses take visitors to most of the popular attractions such as Balboa Park, SeaWorld, the Cabrillo National Monument, Coronado, Old Town, and many other places. 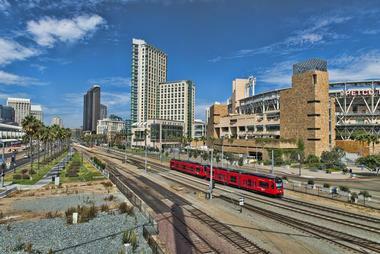 The trolley system is a good way for visitors to get around San Diego’s downtown area. There are three lines: the Blue Line, the Orange Line, and the Green Line. The MTS transit system offers a variety of passes that can be used on the buses as well as on the trolleys. 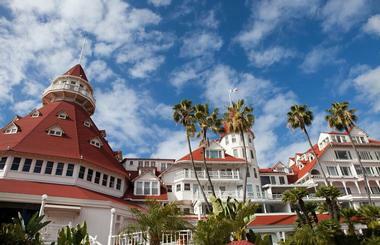 Many people who visit San Diego are interested in visiting nearby Coronado with its famous hotel. 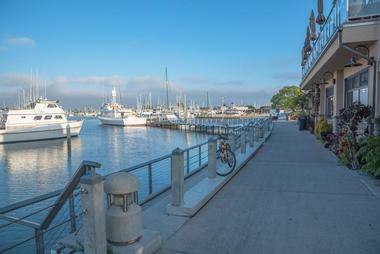 There are ferries that travel to Coronado from San Diego’s downtown Broadway Pier and also from the Fifth Avenue Landing located between the Convention Center. It’s only a 15 minute ride and can be a fun way to travel, especially for children. The ferry service from Broadway Pier runs once every hour on the hour, and the ferries run from the Fifth Avenue Landing every two hours. Another way to get to Coronado is by water taxi. These can be found at any dock around San Diego Bay. People who chose to explore San Diego by car can pick up a rental car at the airport. Using a car not only gets you around the city, but gets you to places out of the downtown area, like unique restaurants and beautiful beaches. The streets of the city are laid out on a grid and this makes it easy for visitors who are driving. If you want to visit one of San Diego’s neighborhoods, you can do this on foot. But if you want to go further you’ll want to consider another form of transportation. Exploring by bicycle is a good idea: there are many designated bike lanes. Taxis are another option, but these get expensive. Although San Diego loves its Mexican food, especially its favorite, the fish taco, the city offers a large variety of cuisines. There are fine dining restaurants, young creative chefs, and, because of the ocean, farms, and ranches, fresh local food is very popular. Locally bottled wine and handcrafted beers are served at many restaurants. The Pacific Beach Ale House serves its craft beer along with tasty dishes. The Prado Restaurant is conveniently located at the popular Balboa Park. Hornblower Cruises and Events has dinner cruises, summer cocktail cruises, and weekend champagne brunch cruises. There are also many ethnic restaurants from which to choose. 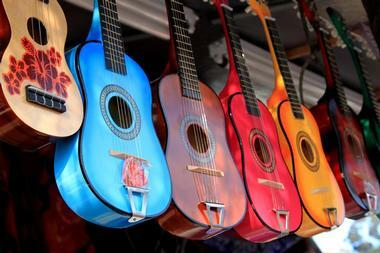 San Diego is a great place to shop with its antique shops, boutiques, luxury indoor and outdoor malls, outlet centers, shopping centers, and vintage stores. Some of the malls are luxury malls while others are more family friendly. The department stores at malls include Bloomingdale’s, Nordstrom, Neiman Marcus, and Macy’s. There are plenty of designer shops like Gucci, Emporio Armani, Prada, and many more. The outdoor shopping centers include the Flower Hill Promenade, the Del Mar Highlands Town Center, and the Forum Carlsbad. There are outlet centers such as Kenneth Cole, Nordstrom Rack, Off 5th Saks, and more. 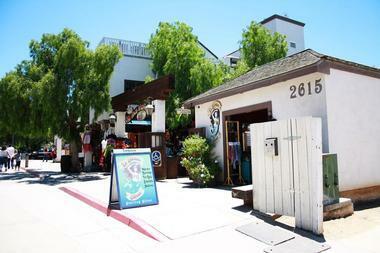 Many of the neighborhoods have antique shops, boutiques, and furniture and home goods stores. 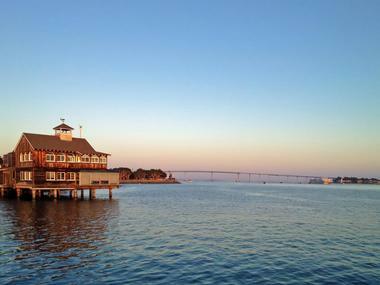 San Diego is made up of several distinctive neighborhoods that show off its cultural diversity. 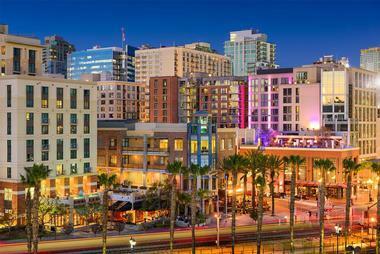 Downtown and the Gaslamp Quarter is the area where many visitors will want to explore. Here they’ll find hotels, restaurants, 19th century Victorian architecture, and the New Children’s Museum. Balboa Park is the most visited area of San Diego: it is a 1,200 acre park full of gardens, the world famous San Diego Zoo, the Old Globe Theatre, several museums and other attractions. Old Town is a state historic park made up of 12 acres of art galleries, museums, restaurants, and shops. Other neighborhoods include Coronado, Barrio Logan, and Hillcrest. 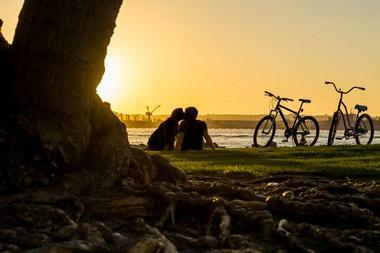 San Diego is the perfect place for a wedding with its pleasant year-round climate, its beautiful beaches, and its many hotels and wedding venues. Some of the hotel venues include the Park Hyatt Aviara Resort, the Catamaran Resort Hotel and Spa, the Bahia Resort Hotel, and the Westin San Diego. Beach weddings are very popular: there are 70 miles of coastline for beach weddings or oceanfront weddings. 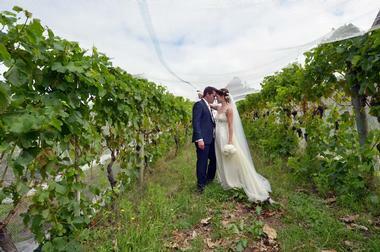 Other outdoor venues include the Ponte Winery and Vineyard Inn, the Grand Tradition Estate, Wiens Family Cellars, and more. 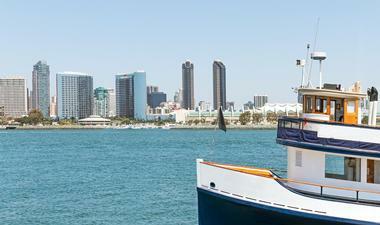 Hornblower Cruises and Events caters to weddings and receptions on its eight elegant yachts. San Diego offers a wide range of options for accommodations, from five star luxury hotels and resorts, historic hotels, bed and breakfasts, and inns to family friendly budget hotels. There are accommodations along the beach, in the desert, and in the nearby mountains. Luxury properties include the Lodge at Torrey Pines, Fairmont Grand Del Mar, the US Grant, and more. Many visitors stay in the downtown area because it is close to attractions like Balboa Park. Old Town and Mission Valley are popular areas for families because of lower room rates and the proximity to attractions like the San Diego Zoo and SeaWorld.